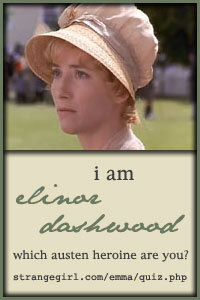 Okay, here I am again! Zander and I went to Utrecht for a week to be with his dad over the holidays. Ad even came home during X-mas day. We had to pick him up at the rehabcentre in the hospital with a wheel-chair and a bottle of oxygen. But he hardly needed the oxygen. So he's doing pretty damn good for a guy who nearly died 3 months ago! 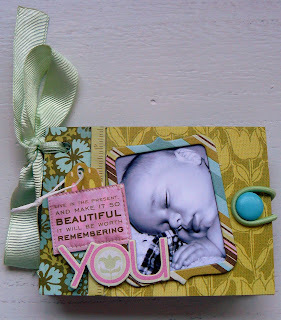 Lots of things to share on the scrapbookpart too. 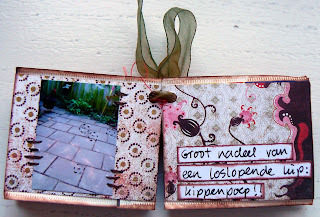 When I was in Utrecht I bought some scrapbooksupplies at Pipoos because I got bored in between the visits to Ad. 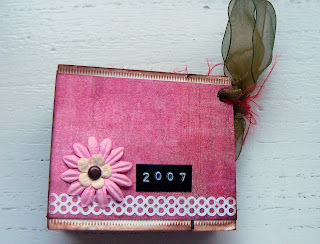 The easiest way was to buy some scrapbookkits with mini books and a small paper pad. I also bought a cutting mat with a kraft knive and some glue and tape. That was it. 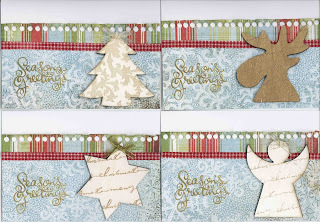 Ofcourse I had no pictures, so I just made the backgrounds and some of the embellishments. 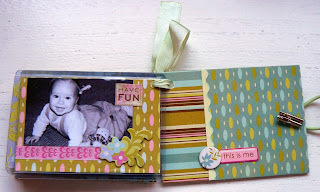 Back home I printed out the pictures and finished two of the mini books. 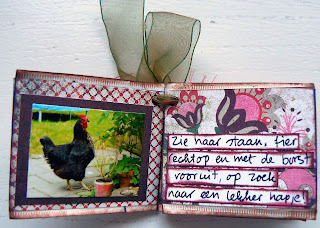 The one with my chicken is made with paper from a paper pad of Basic Grey: infuse. I used small teabags to work on. 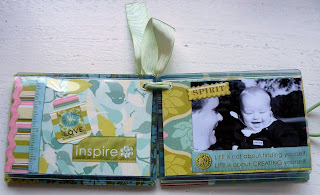 The You booklet with black and white pictures of Zander when he was a baby is from K&Company: Amy Butler Sola Wallet Size Mini Book Kit. Love it! 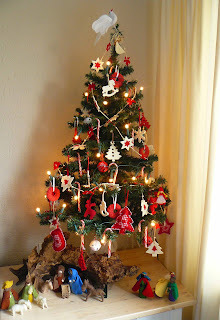 Decorated our small fake X-mas tree last Saturday with mostly felt decorations and some candy canes and chocolate garlands (?) with red sprinkles on top. 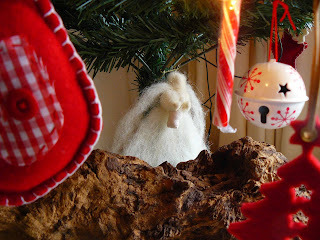 Also put the felt X-mas figures under the tree. 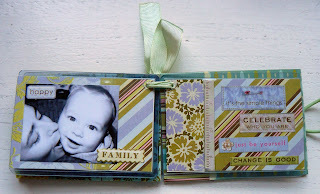 I made these myself when Zander was maybe 2 or 3 years old. It was kind of a tradition to wrap the figures in paper and to let Zander unpack one figure every day. Always in the same order and in a way that followed the telling of the X-mas story. 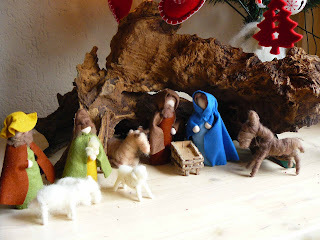 And of course we waited to lay little baby Jesus in the crib on Christmas eve. Untill then he is waiting in the arms of the Angel. But this year, Zander wasn't interested in unpacking the figures. He's almost 14 and not a kid anymore, so of course it is very stupid to do something like unpacking X-mas figures! Oh well, it was a nice tradition for as long as it lasted. I suppose we have to look for other traditions now! 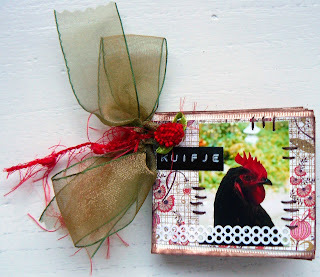 I also made some X-mas cards last Sunday and Monday. I know, a bit late minute but I just wasn't inspired at all. The different figures on the cards are made of wood and I bought them at Xenos. I'm down with the flew. Feeling terrible. It started last Saturday night. When I wanted to let the cat out of my bedroom window, I suddenly found myself sitting on the floor after everything went black. The next morning I woke up with a sore throat, head-ache and more pain in the muscles. I also had those fever chils. I still feel terrible and weak and I'm off to bed again after I have finished this post. 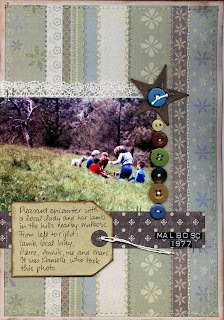 Finished another layout with a photo that was taken 30 years ago when I spent Easter holidays in Malbosc, France. I remember we decided to have a small picnic in the hills nearby Malbosc. There, we met a friendly lady with her lamb. I also remember I couldn't understand what Annik and the lady were talking about. My French wasn't that great at that moment and the lady was speaking with an accent. I also remember that Danielle took this photo and that she was very excited because she thought she had captured a sun-beam. And you know what .... she actually did! If you look left from the lamb you can see the sun-beam. 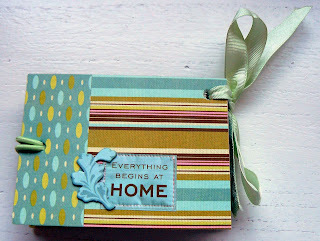 Again I used K&Company patterned paper. I decided I want to make an album with photos of my years in Paris and I want to make it in a vintage kind of style. 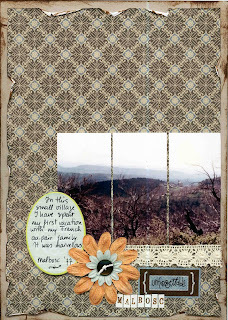 Just finished another layout with a photo of Malbosc. This photo was taken when we went for a picnic in the hills close to the village. 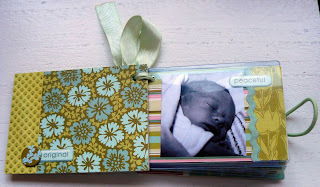 The patterned paper I used is from a large box from K&Company with 200 pp I just bought last week. 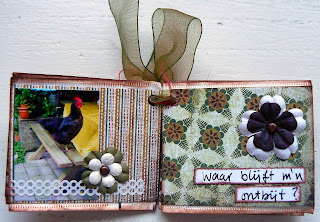 I used a chipboard journaling panel from Autumn leaves, a rub-on from EK success, Prima flowers, a button, lace (market) , brown distress ink and letterstamps. Last Friday Zander and I went to Utrecht to visit his dad, Ad. Ad is still in a hospital but not the same one as before. He's in another hospital where they have a rehabilitation section. We took the train in Groningen because on Friday's the train is already filled with people (mostly students who leave for home for the weekend) when the train arrives in the next station Assen, the city we live close by. The train was already loaded when we arrived on the platform but we managed to find 2 free seats. When we left the station I noticed that the train was going very slowly. After 5 minutes the conductor told us there was a problem with the window of the cabin where the driver was sitting. It was so dirty that it was too dangerous to go faster. They found a solution for this problem but it would take some time. They disconnected the 2 trains (with cabins on each side). Our train went first forward and then backwards and took a side track, so we passed the other train. Then, after a while we were driving forwards again and went on the track where the other part of the train was waiting for us. The trains were connected again and the driver had to walk to the cabin on the front of the train and after that we could continue our trip. It took about 30 minutes to do so. At first the conductor assured us that we could all stay in the train till Utrecht, but when we arrived in Zwolle he told us that we had to leave the train and take another train which was waiting for us on the same platform. Because we were in one of the last compartments of the train we had to walk for quite some time before we arrived to the other train. A lot a people had to take this train and I was afraid that there were no more seats for us. Luckily I found 2 seats in the same compartment but not close to eachother. It was a bit of a problem for Zander to not sit near me, but I told him that if he didn't wanted to stand up till Amersfoort (the next stop) he had no other choice. I was glad we were separated for a while because he made me crazy with his loud voice and all his questions and bad remarks. I know he does it only because this trainride was going differently than the trainrides before and that upsets him, but I felt so tired after an hour of having to deal with this that I needed some peace. When we arrived in Amersfoort a lot of people left the train and we could sit together again. Zander was very releaved! Because we arrived 30 minutes late in Utrecht I can get my money back from the NS (Dutch railway), so that's the only positive thing about this trip! We took the bus to go to the hospital. Ad was looking so much better than the last time we visited him. We just stayed for a little while because it was late and we were tired. Because this hospital is close to Ad's house, we could walk. At his house we rested for a while and then went to McDonalds. That's also close to the hospital but this time we took the bikes. After McDonalds we went to the hospital again. This time we went to the livingroom. There were a couple of old ladies and they asked us if we wanted to join them in playing a game that's called: Sjoelen. It's an old game. You have to slide bricks into 4 holes of a long wooden board. When I was a kid we played this game very often. I hadn't played it for years but I was still quite good at it. We only played 2 rounds and I was second. An old lady was first. She was really good! Zander did okay too, he was third! The next morning I had to do some shopping for me and for Ad. First I went to the 'lapjesmarkt' (fabricmarket) to buy some ribbon, lace and buttons. I also looked for fabric but couldn't find it. After that I did all the other shopping for Ad. It took me more time that I had expected, so it was quite late when I returned home. We had lunch and then went to the hospital again. We spent about an hour with Ad. He asked me to buy a new lock for his front door and a magazine, so I had to go back to do some more shopping. It was still very busy in the shopping centre Overvecht. There was a Sinterklaasmarkt. 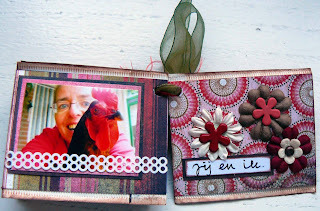 I bought 2 small presents for my friend Petra and her boyfriend Thierry. I also bought some presents for their daughter Julianna. We had dinner and after dinner we went back to the hospital. This time we couldn't get in. 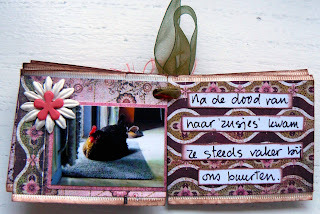 There was a paper on the door that said, that there was a virus (buikgriep). We called for a nurse to come at the door. She told us that Ad also was sick. We could come inside to see Ad, but only when we wore mouthcaps (?) and washed our hands with some blue stuff when we left the ward. We just gave Ad the magazine and I put his clothes (that I washed and ironed in between all the above) and went back to his house again. I managed to replace the cylinder lock on his door. I had never done that before, so I'm proud I succeeded! This morning I slept in, I was soooo tired! So it was a bit late when we arrived at the hospital. Ad was feeling much better and we stayed for about 30 minutes to keep him company. Then I phoned my friend Petra and she, Thierry and Julianna picked us up at the hospital and took us to their house. It was a shame that it was Julianna's nappy time. She turned one on october 31st. Zander went behind the computer and Thierry took a nap. Petra and I drank tea and talked. I'm glad we could spend some time together. Petra brought us to the railway station where we took the train back to Assen. We arrived on time (at 6 p.m.) and my dad was already waiting for us. I'm glad we're home again!